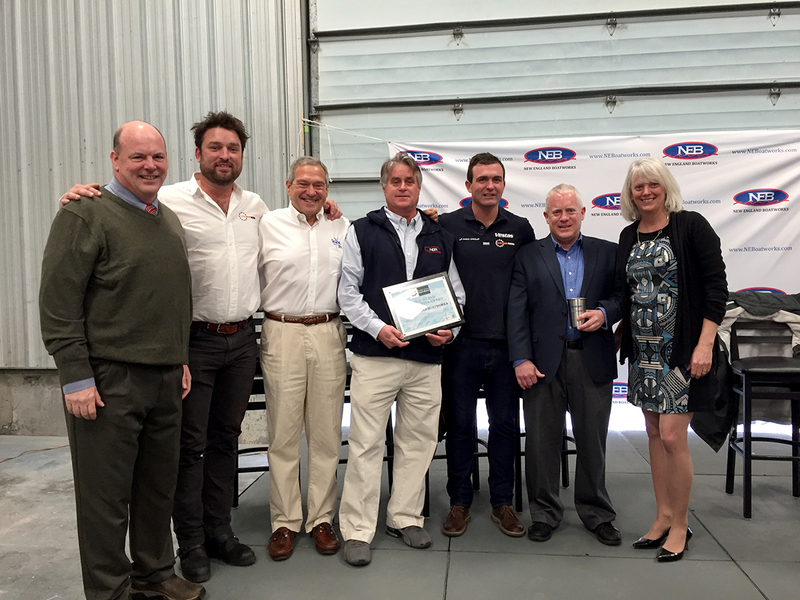 May 8, 2017, WAKEFIELD – The RI Coastal Resources Management Council (CRMC) on May 5, 2017 designated New England Boatworks in Portsmouth as a Clean Marina under its statewide Clean Marina Program, the fifth and largest marina to receive this designation. New England Boatworks (NEB) has been in operation since 1988, and includes a boat-building division that produces custom, state-of-the-art sail and power yachts at its 28.75-acre operation. It boasts a full-service marina offering long-term and transient berths for yachts in its 8.5-acre boat basin, along with complete refit and repair services, and a haul-out and storage facility. NEB joins four other marinas that have already been designated as Clean Marinas: Allen Harbor Marina in North Kingstown (the first to be designated), Point Judith Marina on Point Judith Pond in Narragansett, Ram Point Marina on Point Judith Pond in Wakefield, and Conanicut Marine Services, Inc., in Jamestown, which was designated in 2013. The CRMC adopted the Clean Marina Program in February 2007; the voluntary program is designed to reward marinas that go beyond regulatory requirements by applying innovative pollution prevention best management practices (BMPs) to their day-to-day operations. Program partners include the R.I. Marine Trades Association (RIMTA), RI DEM and Save The Bay. These groups and the CRMC comprise a team that evaluates each marina applying for the Clean Marina designation. As a clean marina, NEB received a special plaque recognizing its status and flags showing the Clean Marina logo. NEB has also taken the additional step of working with Clean Ocean Access to install a Trash Skimmer at its fuel dock. The Skimmer, funded by 11th Hour Racing, reduces marine debris and generates public awareness about types of debris found in the water. Two identical Skimmers placed in Newport Harbor collected more than 6,000 pounds of debris in only four months. As part of this program, a Rhode Island Clean Marina Guidebook and self-assessment checklist serve as tools to assist marinas toward becoming RI Clean Marinas, a designation that certifies marinas, boatyards and yacht clubs that have voluntarily exceeded regulatory requirements and have adopted measures to reduce pollution, and recognizes them as environmentally responsible businesses. Program information is available on the CRMC web site at http://www.crmc.ri.gov/projects/cleanmarinas.html. A Clean Marina pledge requires that marinas striving for this designation pledge to do their part to keep the state’s waters free of harmful chemicals, excess nutrients and debris. It also states that the marina owners will identify opportunities and implement practices to control pollution associated with vessel maintenance; fueling; sewage handling; storm water management; and facilities management. The marina, once a pledge is signed, must implement the pollution prevention practices within one year and apply to the CRMC for the designation as a Rhode Island Clean Marina.